1165+ web files, a regularly updated Gazetteer, overall an in-depth description of our island's internally self-governing British Overseas Territory 900 miles north of the Caribbean, 600 miles east of North Carolina, USA. 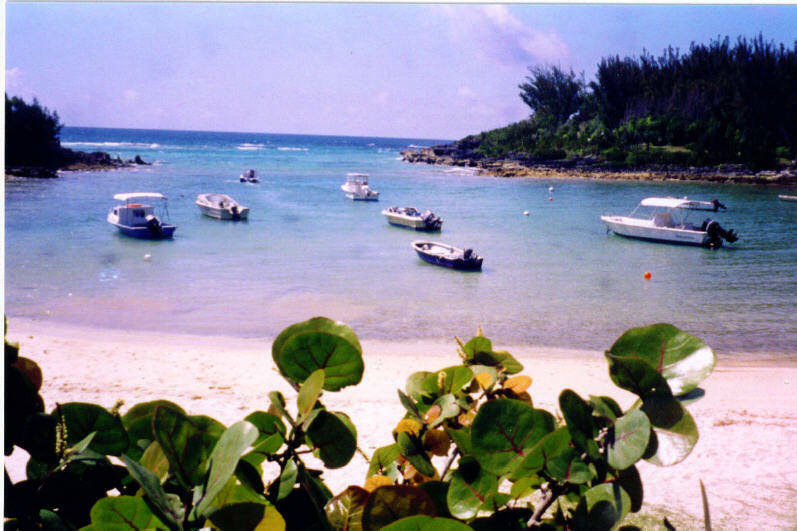 With accommodation options, airlines, airport, actors, actresses, aviation, banks, beaches, Bermuda Dollar, Bermuda Government, Bermuda-incorporated businesses and companies including insurers and reinsurers, Bermudians, books and publications, bridges and causeway, charities, churches, citizenship by Status, City of Hamilton, commerce, communities, credit cards, cruise ships, cuisine, currency, disability accessibility, Devonshire Parish, districts, Dockyard, economy, education, employers, employment, environment, executorships, fauna, ferries, flora, former military bases, forts, gardens, geography, getting around, golf, guest houses, highways, history, historic properties, Hamilton, House of Assembly, housing, hotels, immigration, import duties, internet access, islands, laws, legal system and legislators, main roads, marriages, media, members of parliament, money, motor vehicles, municipalities, music and musicians, newcomers, newspaper, media, organizations, parks, parishes, Paget, Pembroke, performing artists, residents, pensions, political parties, postage stamps, public holidays, public transportation, railway trail, real estate, registries of aircraft and ships, religions, Royal Naval Dockyard, Sandys, senior citizens, Smith's, Somerset Village, Southampton, St. David's Island, St George's, Spanish Point, Spittal Pond, sports, taxes, telecommunications, time zone, traditions, tourism, Town of St. George, Tucker's Town, utilities, water sports, Warwick, weather, wildlife, work permits. Part of Devonshire Parish's crest, from that of the First Earl of Devonshire. His coat of arms, copyrighted by his family, members of which still exist today, is exactly what is shown on Bermuda's Devonshire Parish crest. Used with exclusive permission from the copyright owners. Do not copy. Devonshire Parish is on Main Island, on the North and South Shore Roads and Middle Road. It is the same size as the other eight parishes. It was named for Bermuda's Elizabethan patron, William Cavendish, First Earl of Devonshire (1552-1626). He took his title from the southern English maritime county (Devon, not Devonshire). William Cavendish was the uncle of the Earl of Pembroke. He was born to an enormous fortune. He entered Parliament as the member for Newport in the year of the Armada and remained inconspicuous until the death of Queen Elizabeth 1 and accession of King James. He was given a barony by the King and in 1618 bought his Earldom for a further 10,000 pounds. He was a member of the Council of the Virginia Company of 1612 - which included Bermuda - and Bermuda Company of 1615. He was a gentlemen Adventurer who invested to colonize Bermuda and largest shareholder in the original Cavendish Tribe (Devonshire Parish) in 1619. He never visited Bermuda himself. He died almost unnoticed in 1626. In January 2009 The Royal Gazette reported that portrait of a woman whose father was governor of the Bermudas Company was expected to be sold for as much as $700,000 at auction. Christie's, in New York, included the 17th century portrait of Anne Cavendish, later Lady Rich, in its Important Old Master Paintings and Sculpture Auction that take place in Rockefeller Plaza on January 28. The painting was done by Anthony Van Dyck, a Flemish Baroque artist and the leading painter of the English courts, most famous for his portraits of King Charles I, and the auction house estimated its value in the range of $500,000 to $700,000. His portrait of Anne Cavendish was painted in 1637, during his second stay in England, and just a year before her death and four years before his own. The painting has an illustrious history of ownership, as seen in the details of provenance provided by Christie's, having been owned by among others, Sir Robert Walpole, Prime Minister of Great Britain from 1721 to 1742. Although Anne Cavendish may herself never have visited Bermuda, strong connections to the island can be found in both her family tree and in that of her husband, Robert Lord Rich. 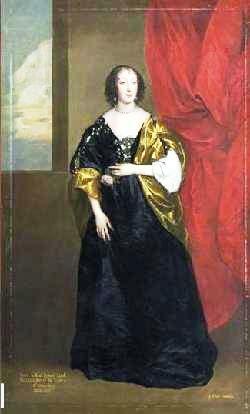 Anne was born in 1611, daughter of Sir William Cavendish, 2nd Earl of Devonshire (1590 to1628), and her grandfather, also Sir William Cavendish, was the 1st Earl of Devonshire one of the grantees of Bermuda and an original member of the "Company of the City of London for the plantation of the Somers Islands". Devonshire Tribe and Cavendish Fort were named for him and the Earl of Devonshire is said to have owned 245 acres of land in Bermuda by 1663. Her father, the 2nd Earl, continued in the family business and was governor of the Bermudas Company. In 1632, Anne married Robert Lord Rich, the 3rd Earl of Warwick, who also had strong ties to Bermuda. His father, the 2nd Earl of Warwick, was a manager of the Bermudas Company. Warwick Parish was named for him, its crest taken from his own, and it is said that Warwick Academy was built on land donated by the Earl in mid 17th century. Anne died in 1638, at the age of 27, mourned in a poem by Edmund Waller and Sir John Denham: "That horrid word, at once, like lightning spread, struck all our ears the Lady Rich is dead! Heart-rending news! And dreadful to those few who her resemble, and her steps pursue." 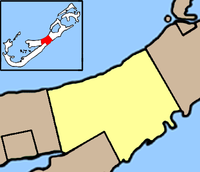 In other Bermuda Parishes - not this one - there are areas with the prefix of Cavendish - also after the Earl. Early settlers referred to Devonshire Tribe as Brackish Pond. It was because of the large marsh in the center. Today, Brackish Pond is Devonshire Marsh. Parts of it are sightseeing attractions for naturalists. 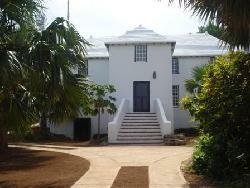 Bermuda's Architectural Heritage: Devonshire. Trimingham, Andrew. 1995. 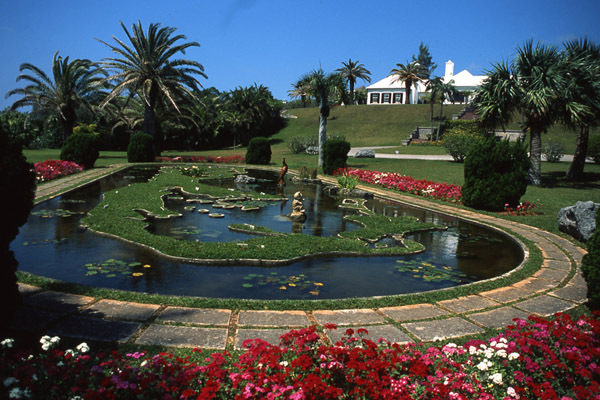 Bermuda National Trust. The first in a series of illustrated (black and white, not color photos) parish by parish reviews of Bermuda's architecture. Out of print. In the last General Election, each of the following districts had about 1,250 registered voters, covers about 0.58 of a square mile on average and has its own paid Member of Parliament (MP). At the corner of Montpelier and Middle Roads. A Bermuda National Park with moped/scooter and car parking. Open from sunrise to sunset, free to the public. No organized gardens or flowerbeds but serene inland setting of 22 acres of open space with tall trees, open meadows, pathways, shrubs, collections of conifers, palms and genus ficus. See Bermuda cedar trees (a unique form of juniper), flowering golden acacias, avocados, acres of cherry forest and rubber trees with hanging tendrils along with many other species. Plus, a bird sanctuary noted for cardinals and bluebirds. An ornamental bridge has small pools underneath. Enjoy a picnic here, also a great walking area, with shade trees, accessible by the route 3 bus and a short walk. The property has an interesting history. From the mid 19th century, like most of the Parish at the time, it was once - but no longer - part of British Army lands at "Montpelier" nearby - the private house now owned by the Bermuda Government and now lived in by the Deputy Governor. 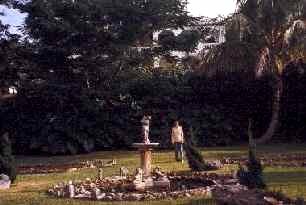 In 1962, some years after the British Army left Bermuda, the lands were planted by the Bermuda Government's Department of Agriculture as an arboretum with a specific purpose - to have at least one specimen of all the trees that will grow in Bermuda. Across from the Mid Atlantic Wellness Institute, formerly St. Brendan's. Founded in 1964, it is staffed by volunteers from the Hospitals Auxiliary of Bermuda, a registered charity. The original Barn opened on April 4, 1964 on The Lagoon South Shore, Paget property of Sir Henry and Lady Tucker.Madame Helene Frith, a French lady who married a Bermudian and settled here, was one of the founding members. Others were Lady Tucker, Mrs. Brownlow Tucker and Mrs. Walter Staebler. The second Barn was a portable cabin from England and opened in 1986 on Bermuda Government property across from St. Brendan's Hospital. In July 2002, it opened new premises, where it is now, at 5,000 square feet nearly four times the size of the previous area. The newest facility adjoins the latter. The Barn has some of the best bargains in Bermuda. Locals and visitors come on a Thursday or Saturday morning from 9 am to 12 noon every week to find previously owned goods and clothes here at a fraction of the prices of retail stores. About $250,000 is raised annually by the Barn from donated goods of all kinds. It has become the leading moneymaker for the King Edward VII Memorial Hospital. About 1.5 miles into Vesey Street, off Middle Road. HQ of the Bermuda Equestrian Federation. P O Box DV 583, Devonshire DV BX. Runs the Bermuda Equestrian Centre. Established via Bermuda's first-ever Special Development Order in October 1997. Regular Junior International Show Jumping Competitions and other equestrian events occur here. For all interested in ponies, harness racing and scheduled competitive equestrian activities. The facilities include a show ring, stands and parking for patrons and spectators. This is where the Federation Equestre Internationale (FEI) sometimes stages the annual International Dressage Competition. Bermuda is one of six nations in Group II, the others being Mexico, Costa Rica, Guatemala, Colombia and Peru. Bermuda's riders make a fine showing in the event. The Driving Horse and Pony Club of Bermuda (DHPC) holds regular events here. The first meeting of the DHPC was held on July 4, 1973. While the purpose of the Club has transitioned from hosting driving shows to harness racing, the relaxation and enjoyment people have in watching remains the same. Harness racing is a worldwide sport but in Bermuda the challenge of racing has higher demands due to the size and shape of the DHPC racetrack. Competitors and spectators feel the power of the ponies as they strive to do what they do best which is go fast and win. This sport requires dedication, determination and commitment from its competitors but it is also dependent upon a strong support group, like any other sport. The Club's Executive Committee, its membership and those with any interest in the club are all volunteers committed to working together to ensure a strong foundation by which the sport of harness racing can continue to develop and grow. Only one remains in this Parish, at Devonshire Bay. There are several, all shown by name below. 50 Frog Lane, Devonshire DV 01. Telephone 295-8085. Bermuda Government owned and taxpayer financed. 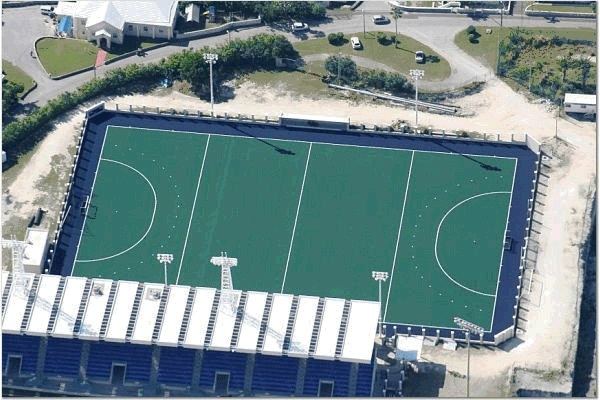 Construction work began several years ago at its complex the Bermuda National Stadium and millions of dollars have been spent. The first international soccer games were played here in early 2001. Cricket, Track and Field, soccer and many other sports are played here. Mailing address is The Manager, P. O. Box HM 2262, Hamilton HM JX. Prospect, the former British Army base until the 1950s. 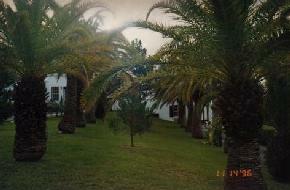 Premises include the Police Club, popular with expatriates as a bar and for social events. 11 Middle Road, Devonshire DV 06, next to the National Sports Club. Telephone (441) 292-6881. Fax 295 8718. The Junior Program is Bermuda Registered Charity 549. The only place to play squash (racquetball) in Bermuda. Many competitive events are held here, including several involving world class squash personalities. This pleasant rural road links the South Road with the Middle Road. En route, it leads to Brighton Hill Nursery, a favorite gardening supply center for many Bermudians and residents; also, via Watlington Road East, to a leading supermarket. On the left at the very bottom, where Brighton Hill Road meets the main Middle Road, is Old Devonshire Church. Almost no traces remain of how this parish was once the headquarters of the British Army in Bermuda, with not just one but several former forts as the bastion. At one time, more than 75 percent of the parish was compulsorily acquired by the army for military purposes. In 1863, following major improvements in British shore-based British Army gunnery in terms of range and accuracy, Fort Langton was built here as part of the massive British Army deployment plans in Bermuda. It became the only fort ever constructed on the north shore of the main island of Bermuda. Fort Prospect, not a fort per se but with a strategic purpose was the headquarters of major military base, complete with a garrison school. In the 1930s and most of the 1940s, especially for the Garrison, there was a Prospect Halt for the Bermuda Railway. 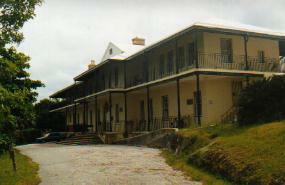 Today, all that is left of the once huge base which even had its own school, church and parade ground are a former British Army hospital, now used as the headquarters of a Ministry of the Bermuda Government, a graveyard (which includes the grave of a British Police Commissioner for Bermuda assassinated in Bermuda by black cadre extremists, and original Officers Mess, now the Police Recreational Club. The Parish is served by the following routes that go to and from the city of Hamilton. Some routes are much better served than others in frequency and lateness. See the schedule available free from the bus terminal in Hamilton and note its times on Monday to Friday, Saturday, and Sunday & Holiday, as well as where the routes go and do not go in the Parish. 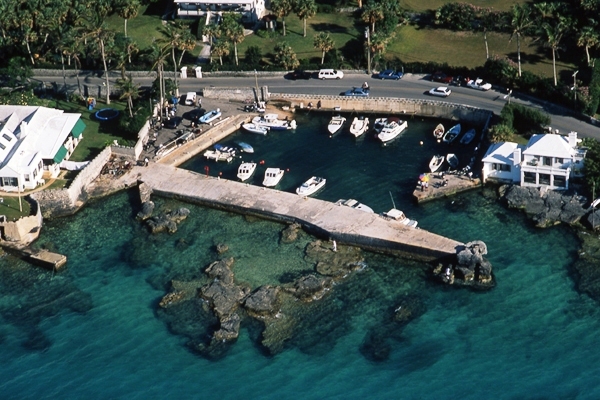 # 1 route (Hamilton to St. George's, on the South Road, former Mariott Castle Harbor, The Caves and Grotto Bay). # 3 route (Hamilton to St. George's on the Middle Road, Harrington Hundreds, Knapton Hill, The Caves and Grotto Bay). #10 route (Hamilton to St. George's via Palmetto Road, North Shore, Aquarium and Bermuda Perfumery). #11 route (Hamilton to St. George's via Black Watch Pass, North Shore, Aquarium and Bermuda Perfumery). Roberts Avenue. Not a place visited by many tourists, a rather grim place in an area outside of the tourist map, but of interest as Bermuda's only Roman Catholic cemetery. Most of Bermuda's Catholics are interred here. It is referred to by local Catholics as Holy Cavalry Cemetery. It is also the final resting place of a Canadian 1st World War soldier, buried there in April 1915. In Bermuda, Catholic churches have never been allowed, unlike Anglican Episcopalian and other non-Catholic churches, to have their own cemeteries. New headstones for many graves were put into place in 2013-2014. Middle Road, the Anglican Parish church, next door to Old Devonshire Church. With its own graveyard. In 2008, the once-lovely old Rectory residence, see below in this 1949 photograph by step-daughter Cindy Farnsworth (later, Olden) of the Rev. Keith Harman. He was then the Rector of Devonshire and Chaplain to the Prospect Garrison. He was a keen amateur photographer. When he did his tour of duty as Private Chaplain to King George VI in 1951 he took pictures of Windsor, the famous Doll's House, etc. The Queen liked them so much he had Kodak make special prints from his transparencies which he subsequently sent to Her Majesty! She wrote back to thank him. The building, at 106 Middle Road, Devonshire, was razed to make room for four studios, four one-bedroom apartments and a two-bedroom condo. A new rectory was then built instead. A suburban site for bird watching. Prospect. Since 2013, completed in 2014. A sporting facility. Named in honour of Bermuda’s most successful footballer. Adjacent to the BFA Field where the two-storey 4,000 square foot building houses BFA offices on the upper level and changing rooms, a physio room, gym and bathrooms on the lower level. A Bermuda National Park. On Bus route # 1. A scenic attraction well worth visiting. A nice family-friendly location. Take Devonshire Bay Road off South Road. Stay to the left until the road ends and park begins. There is parking for scooters and cars. A combination of a ruined fort, fortified history, bay, public beach, park for sightseeing, swimming, and parkland. The beach is the only public one on the South Shore of this Parish. There are little wading pools here and there. The small fort of Devonshire Bay Battery is one of the survivors of once many coastal batteries or forts that stretched the entire length of Bermuda, during the days of the British Army in Bermuda. The park is a safe place to swim, in a tranquil setting, great for a picnic, with shade trees and sea views. Quite often you'll see local fishermen selling their catch. Watch how they filet to order. This is a good place to buy fresh fish straight from a fisherman, if you are staying in a type of place that permits you to cook your own food. It is delicious, far more satisfying than imported fish bought from a grocery store. But be prepared to pay upwards of US$ 9 a pound. Off the main North Shore Road, at the junction with Dock Hill. No public parking. Visit on a Sunday when the road is not nearly as busy as there is too much traffic nearby on other days. It once serviced the ships of the Royal Navy during the War of 1812-14 against the USA. Thousands of seaman and soldiers arrived here, or departed from nearby camps. From nearby potable fresh-water wells were dug by a combination of British Army sappers and miners, locally-recruited labor and the Royal Navy especially for the 1812-14 War against the USA, and carried to the very small vessels alongside or moored offshore in pinnaces in barrels to serve crew and marines. Nowadays, the dock, much improved since those 1812 days, is used for fishing and pleasure purposes by local fishing craft, and other small craft owners. There's a beautiful view of the North Shore coastline. From the Middle Road at the Nationals Sports Club west for a mile and stretching north, this marshy area was the earliest major feature of the Parish and known as Brackish Pond. Because of it, the whole Parish was once unofficially dubbed Brackish Pond. Today, the "pond" part isn't so obvious, partly because of the fact that perimeter parts of the area bordering Middle Road have been reclaimed for farming, light industrial and recreational use. Several areas of Devonshire Marsh have now been designated as the Firefly Nature Reserve and Freer Cox Nature Reserve, both mentioned below. The easternmost end of the marsh was drained years ago to provide the playing fields for the National Sports Club. The Devonshire Marsh suffered a bad fire in December 1996 but recovered well. 2019. March 18. One year after a wall of fire sparked by an industrial accident charred 30 acres of Devonshire Marsh, conditions there remain ripe for another blaze. Spurred on by strong winds, the fire swept the reserve despite a massive effort by the Bermuda Fire and Rescue Service. The fire, which threatened several businesses and residences, and repeatedly jumped the main road, remains “a perennial threat” at the wetland, the Bermuda Audubon Society warned. The blaze of March 17, 2018 was “accidentally caused”, according to the BFRS report, obtained by The Royal Gazette. Investigators ruled that winds carried a spark from welding at Island Construction, where an employee was working outside on top of a shipping container, 90 feet into the marsh. Once covered in trees, the reserve has become a haven for flammable invasive plants. Staff at Island Construction raised the alarm at 7.30am, but winds which had been forecasted at up to 35mph swiftly drove the flames southeast and out of control. For Graham and Joanna Frith, whose home juts into the marsh at the base of Brighton Hill, an ordinary Saturday quickly proved to be unforgettable. Ms Frith recalled boarding an early flight to New York, when a stream of pictures and messages to her phone showed the blaze advancing on her house. “Graham ended up having a more interesting weekend,” she said. “What made it surreal was coming back on Sunday night with our house and all our belongings untouched. I realised just how lucky we were.” Mr Frith was initially told by neighbours it was “nothing to be too worried about”. He added: “Ten minutes later my neighbour asked if I had the keys to my car, because I might need to move it — it had gotten bigger and crazier.” Returning home, he found a fire truck in front of his home, and was told by the landlord to “get what you can as quick as you can, and get the hell out”. This summer, the Friths will mark seven years at the residence, which they love for its wooded surroundings and wildlife. But the wetland, denuded by cattle grazing and the loss of endemic cedars, today teems with bracken and saw grass that became tinder. Mr Frith said: “It was unbelievable, watching how fast it moved. It was like a microcosm of the California fires.” He locked up the house, grabbed a few valuables, moved his car and tried to rescue their cat, which “took off like a bat out of hell”. Their pet returned later. Mr Frith spent the day watching the blaze, which was doused as it ignited trees across Middle Road, but swept perilously close to businesses on Marsh Lane. It also burnt around the edge of his property and scorched palmettos in his yard, but came no farther. “All the firemen were out doing a fantastic job,” Mr Frith said. “But they had a tough day. Seeing how close it came, we were unbelievably blessed.” Today, Mr Frith said, the marsh looks as though “nothing happened. It’s cool to watch nature take it back,” he said. Asked if he worried of a repeat, Mr Frith said: “Older people talked about when there were fire channels. Right now there’s no way to cut a fire off.” In the immediate aftermath, staff from the Department of Environment and Natural Resources had easy access to cull more than 300 flammable invasive plants from the centre of the marsh. A year later, open-water ditches remain the best option for limiting a recurrence, the Audubon Society’s report said. Waterways dug in the 1940s criss-crossed the marsh and were maintained until about 20 years ago. The report advised that reviving the channels could provide fire breaks in the future, as well as water for firefighting. The Devonshire Marsh Basins, east and west, represent the largest remaining open space area on Bermuda and provide an relatively unfragmented and diverse variety of habitats. This enables these wetland areas to support a large variety of species, including species only recorded from these sites that contribute significantly to the biological diversity of the island. They also provide an important stopover and passage habitat for migrant species stopping on passage or forced down by adverse weather conditions. This is the largest peat marsh / basin mire in Bermuda, also with a freshwater lens, comprising predominantly native vegetation and containing rare / scarce species. Peat has a depth of up to 12m. 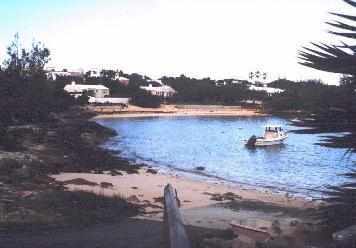 This wetland is of considerable importance in a Bermudian context. The site contains a fossil archive of changes in Bermuda’s vegetation over the Holocene. An international group visiting as part of the UK Overseas Territories Conservation Conference in 2003 were impressed with the quality of this site which consists of two peat land basins (bisected by a road and current industrial uses) and adjoining areas of (non-native) woodland. 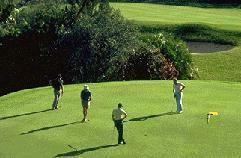 Together with an adjacent golf course, they form the largest area of open ground remaining in Bermuda. The wetlands consist of predominantly native vegetation, support some rare and scarce plants and are important for passage and wintering birds. The group felt that the site met criterion 1 of the Ramsar Convention, namely that it contains a representative and rare example of a natural or near-natural wetland type found within the appropriate biogeographic region. It should thus be considered as a candidate wetland of international importance. The site scored very highly for features such as size, naturalness, biological diversity, rarity (of habitat), typical ness and potential for education, public awareness and research, especially in light of its central location and ready access. The marsh contains patches of relic peat hammock forest dominated by endemic and native tree species, shrubs and ferns, the only marsh on the islands besides Paget Marsh to retain this habitat. The western basin is the only known locality where the rare native Ten Day Fern Still survives on Bermuda. It also contains extensive areas of Cattail and Sawgrass savannahs, shrub-dominated wetlands, and seasonally flooded wet pasture and agricultural land. The relatively large size (in the local context), diversity and range of habitats support a large population of migratory and over wintering birds in addition to resident species. Over 95 species of birds have been recorded in or over this area, and the site is particularly important for shorebirds and water birds, in addition to passerines and raptors. Notable among these are American Bittern Botaurus lentiginosus; Yellow-crowned Night Heron Nyctanassa violacea; Green Heron Butorides striatus; Little Blue Heron Egretta Caerulea; Tricoloured Heron Egretta tricolor; Cattle Egret Bubulcus ibis; Snowy Egret Egretta thula; Great Egret Casmerodius albus; Glossy Ibis Plegadis falcinellus; Snow Goose Chen carulescens; Mallard Anas platyrhynchos; American Black Duck Anas rubripes; Green-winged Teal Anas crecca; Northern Pintail Anas acuta ; Northern Shoveler Anas clypeata; Blue-winged Teal Anas discors;Ring-necked Duck Aythya collaris; Sora Rail Porzana Carolina; Purple Gallinule Porphyrula martinica; Common Moorhen Gallinula chloropus; American Coot Fulica Americana; Semipalmated Plover Charadrius semipalmatus; Killdeer Charadrius vociferous; Greater Yellowlegs Tringa melanoleuca; Lesser Yellowlegs Tringa flavipes; Solitary Sandpiper Tringa solitaria; Wilson’s Phalarope Phalaropus tricolor; Short-billed Dowitcher Limnodromus griseus; Stilt Sandpiper Calidris himantopus; Common snipe Gallinago gallinago; Semipalmated Sandpiper Calidris pusilla; Least Sandpiper Calidris minutilla; Pectoral Sandpiper Calidris melanotos; Merlin Falcon Falco columbarius; Peregrine Falcon Falco peregrinus; Common Yellowthroat Geothlypis trichas; Yellow-rumped Warbler Dendroica cornata; Northern water thrush Seiurus noveboracensis; Palm Warbler Dendroica palmarum; Indigo Bunting Passerina cyanea; Swamp Sparrow Melospiza Georgiana; Savannah Sparrow Passerculus sandwichenis. Oddly, despite the bird-life, there are no places specifically to observe the birds and no trails or signs. These are areas almost completely ignored by tourists. The Devonshire Marsh West Basin totals 21.6 acres in area; the larger Eastern Basin totals 54.5 acres in area. They are located in inter-dune valleys with high dune hills all around their periphery, and dip in the middle to a depth of 12-16m below present sea level. These basins are filled up to or just above water (sea) level with peat and plant debris, upon which grows the various plant communities that comprise the wetlands. The highest dune hills (60m) are located on the north and west sides of the wetlands and are relatively young at 200,000 years of age. Rainwater seeping through these loosely cemented Aeolian limestone formations forms a large fresh water lens under this section of the island, including the marsh basins. These wetlands are therefore essentially fresh water marshlands, which are comparatively rare on Bermuda. Soils are generally organic peats or loams on the periphery. The Marsh basins receive large inputs of rainwater run-off during heavy rains, particularly from roads and industrial sites on their borders. These marsh basins are subject to drainage of both surface (mainly road run-off) and sub-surface water from a large catchment area of approx. 2 sq. miles. They are also underlain by the largest sub-surface fresh water lens on Bermuda. There is extensive extraction of water from this lens in and around the Devonshire Marsh West Basin by means of both vertical and horizontal ‘gallery’ wells. This water is treated and distributed to customers around the central Parishes of the island. Appointed under the Parish Councils Act 1971. See under "Parish Councils" in Bermuda Government Boards. Appointees are political and meetings are not open to the public, unlike in the United Kingdom, Canada and USA where parish or community councils always are. A Bermuda National Park and Reserve. Map available from Bermuda Parks. South Road. A sign points to it. It is just before this road enters Smith's Parish. You may enjoy seeing it more on a Sunday before the traffic starts getting constant. It's a walking reserve, with no admittance fee. It has local flora, fauna and migratory birds attracted to the pond and marshlands. It is small but scenic. Please leave only footprints, no trash. Off Middle Road, across from Old Devonshire Church. It's a 10 acre area of Devonshire Marsh, in these two named sections. They serve as a sanctuary for birds, endangered species of local fauna and a breeding ground for wild orchids. There's no admittance fee. These are especially interesting areas for botanists, entomologists and those who appreciate nature generally. Both Reserves are under the care and protection of the Bermuda Audubon Society and Bermuda National Trust. Please leave only footprints, no trash. A Bermuda National Park at the junction of Parsons Lane with Palmetto Road. If you rent a moped, it's the perfect vantage point from which to begin to explore a rural part of Bermuda. Head south, down Parsons Lane. At the junction, either stay on Parsons Lane until you reach the Middle Road, or veer to the right on Orange Valley Road. 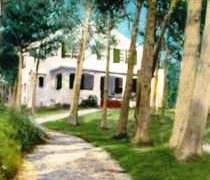 Enjoy the hedge rows, country lane atmosphere, small byways, small homesteads and farms, and a rural life fast disappearing in Bermuda. The above file gives details of local golf courses, all quite close. This Parish has a good one, see below. Jubilee Road, in the old Elliott School building owned by Christ Church, Devonshire. Includes the Elliott Art Gallery. The original Elliott School was built in 1848 by 12 black men as a school for young black children of the parish. It became a monument to the vision of the builders, a symbol of black pride and a slice of Bermuda's rich history. 15 Middle Road, Devonshire Parish. Historic house, private property, not usually open to the public. Owned by Mr. and Mrs. William Cox. 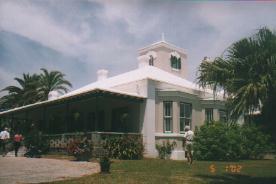 Completed in 1893 by William J. Cox, it is an outstanding Victorian interpretation of a traditional Bermuda house. Characteristic of the era are high ceilings, wide verandahs, three-storey tower and widow's walk. The handsome doors, windows and floors are Bermuda cedar or imported solid pitch pine which was more highly valued than cedar at the time because of its scarcity. At the end of a long drive through spacious grounds, Mayflower looks out on a pool and to the South Shore beyond. . A charming historic Bermuda house which in May 2009 hosted the Garden Club of Bermuda's gala party in the grounds as part of its celebration of Bermuda's 400th anniversary. The event, appropriately entitled 'Mayflower in Bloom', allowed allow residents and visitors to enjoy the fine collection of furniture and paintings in the home, as well as the many beautiful floral displays created especially for the occasion by skilled Garden Club members. The gracious residence is the home of William (Bill) and Rosanna Cox, and was built in the late 19th century by William Cox, an ancestor of the present owner. 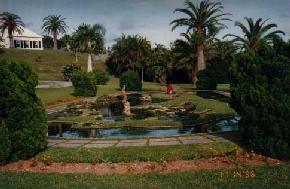 It was also the home of Freer Cox, a founding member and the first president of the Garden Club of Bermuda. Among its furnishings are several items made by the present owner from Bermuda cedar cut from the property, as well as paintings by Mrs. Cox's son, well-known artist Henry Ward. A special feature of the house is the three-storey tower which includes a widow's walk so-called because this is where a wife would wait, often in vain, for her husband to return from the sea. Saturday's visitors will be invited to climb up and see both the North and South Shores. 'Mayflower' sits in ten acres of grounds which were the scene of a host of garden-related activities. The several garden areas include a nice grouping at the front of the property and more flowers and plants by the pool with a view of the South Shore. Until 12th May 2005, St. Brendan's Hospital. On 28 April 1841, the Bermuda Legislature passed an "Act for the Safe Custody of Insane Persons charged with Offences. " It was the first local legislation to deal specifically with persons with mental problems. Persons charged, if found insane, were kept in custody until they went to an asylum. In 1846, a further Act was passed to establish a hospital for the reception of "insane paupers." It enabled the Governor, Lieutenant Colonel William Reid, to buy land in a central parish for an asylum. Seven acres of land on the North Shore were acquired for 400 pounds sterling and two cottages were built for £600 sterling. The Governor had to approve admissions and discharges to the asylum and in which categories incoming people were, as a lunatic or insane person or idiot or pauper or person of unsound mind. Dr. Henry Josephus Hinson, a graduate of Edinburgh Medical School in Scotland, was the first medical superintendent for the new Lunatic Hospital in 1848. It remained in its original location for 22 years until it moved to its present location in 1868, the site of the former Devonshire College. Later, under Governor General Sir John Lefroy, the Devonshire College buildings were expanded after he convinced Parliament to spend £3,650 sterling to pay for additional work. A much larger facility was required from the beginning of the 20th century, especially during and after the two world wars. St. Brendan's became its official name, after the Irish saint born about 484 AD. There is a legend that he sailed across the Atlantic Ocean and that there was a St. Brendan's Island. (A local doctor - Dr. Juanita Guishard - wrote a book about it - Legend of St. Brendan's, published by the University of Toronto Press, and speculates it might have been Bermuda). At one time, local nurses only were employed, trained mostly in England. Then nurses were brought in from Britain and the Caribbean. In the early 1970s, management passed from the Department of Health to the Bermuda Hospitals Board under the Ministry of Health. 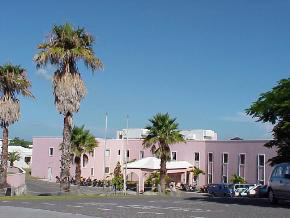 Today, this is the only mental, or psychiatric, hospital in Bermuda, a therapeutic institution that has clinical programmes to address different specialties of mental health services. 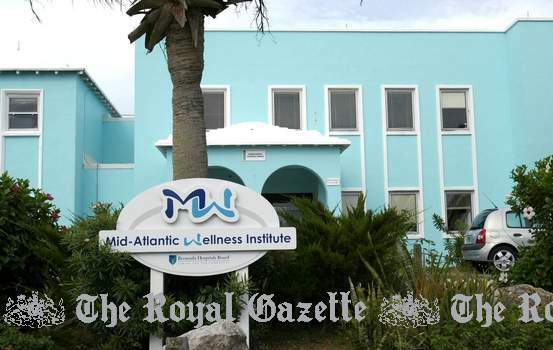 Currently at MWI, there are four psychiatrists on staff, all of whom are non-Bermudian, in addition 70 percent of the in-patient nursing staff are also foreigners. It has 68 inpatient beds, 28 of which are allocated to the acutely ill and with the other 40 for long-stay clients. About 800 persons in Bermuda are actively involved at some level as outpatient clients, The in-house Petting Zoo and Plant Garden here (the second hospital in Bermuda, the other a general one) is of interest. Its New Dimensions Centre recreational therapy department draws on a gentle and innovative form of therapy for people who are depressed or schizophrenic or with learning or physical disabilities, or who have had experience in or grown up with animals. A wheelchair ramp and seating area have been built in the open-air courtyard. Huts have been constructed for animals, for clients of the hospital to feed the animals, sweep the area, tidy up, plant and weed the garden, water herbs and vegetables. Many local businesses have contributed animals or materials. Currently, the facility includes 4 rabbits, 4 guinea pigs, 2 hamsters, 12 chickens, 10 parakeets, a talking parrot, 2 finches and 1 turtle. Able visitors are also welcome if they have an interest in the less fortunate. The institution has maintained its accreditation from the Canadian Council of Accreditation since 1970 and has also been accredited by The Royal College of Psychiatrists in the United Kingdom, to serve as a teaching hospital for junior doctors training to become Consultant Psychiatrists. "Bermuda is way ahead of the game in terms of service delivery. We are not behind at all, we are very much in the cutting edge when it comes to our service," she said. It changed its name from St. Brendan's Hospital to Mid-Atlantic Wellness Institute in 2005 for several reasons, to truly represent the services it offers as not just a hospital but a place with many community programmes. It runs group homes and clinics and does a lot of outreach and educational presentations. It is not just an in-patient treatment centre but offers a new beginning to help destigmatise the issues surrounding mental illness. This Parish's portion of this central main road begins about half a mile east of the city of Hamilton and continues east for several miles en route to Smith's Parish. It is on the # 3 bus route. If you try to stay off this road during peak rush hours of 4:30-5:45 pm. you'll enjoy the many sights along the way. 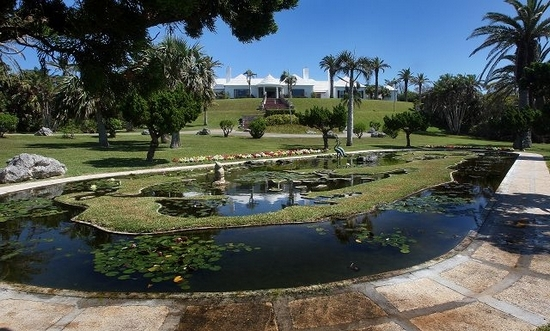 Look at the architecture of homes and how proud Bermudians are of their gardens. You'll pass by the southern side of Devonshire Marsh on your left, Old Devonshire Church on your right, then the National Sports Club and Bermuda Squash Club. A little further east, you'll cross into Smith's Parish. 50 Frog Lane, Devonshire DV 01. Telephone 295-8085. Mailing address is The Manager at P. O. Box HM 2262, Hamilton HM JX. An agency of the Bermuda Government since the 1960s. 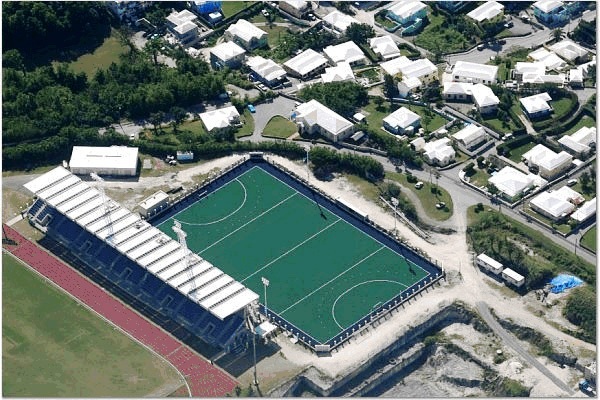 The responsibility of the Ministry, which runs the National Sports Centre (INSC), is to promote and support leisure and sporting activities in Bermuda. It has a National Sports Centre Trustees Board under the National Sports Centre Trustees Act 1988. Appointed by the Minister of Community Affairs and Sport. Bermuda Government owned and taxpayer financed. 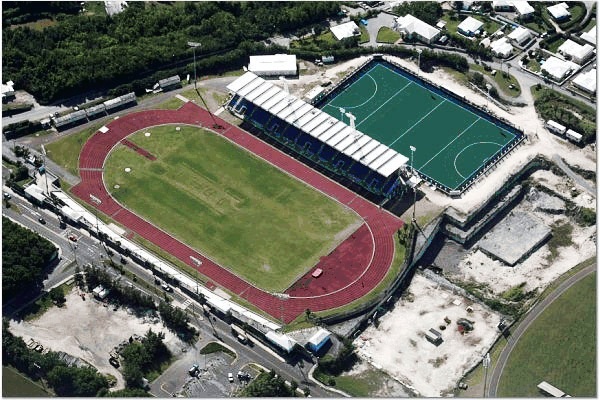 The site of the old Bermuda National Stadium which was built in the 1960s then demolished in 2007 to make way for the NSC. Until the 1950s the entire area of the NSC did not exist. Instead, it was a field, training ground and military parade and march-past centre of the British Army in Bermuda and part of the operating headquarters of the formidable Fort Prospect Garrison constructed there. In/from the 1860s, the British Army took over a huge section of the entire Devonshire Parish area to safeguard Bermuda from any possible threat from the USA or elsewhere. Millions of dollars were spent by the Bermuda Government to bring it up to international standards. It included construction of a multi-purpose sport field. Facilities include undercover seating for 2,000 spectators, numbered seats, a timing booth for track and field events, a three-section press box for local and international media, two concession stands, changing rooms, bathrooms and auditorium for large concerts and musical events. The first international soccer games were played here in early 2001, now regular events. 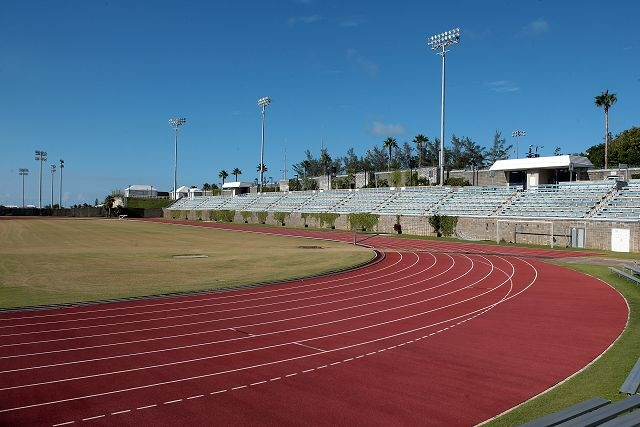 This is also the main venue for international sporting events including the CARIFTA Games which Bermuda has now hosted four times and the Island Games which Bermuda hosted recently. Other sports played here include cricket and rugby. By autumn 2012, the long-awaited Aquatics Centre at the (NSC) complete with 50-metre pool, diving pool and therapeutic facilities, was up-and-running. The multi-million dollar project, which had been in the pipeline for several years, reflected the needs of the whole community, not just those of the Island’s elite athletes. The Aquatic Centre, the only 50 metre pool on the Island upon completion, is a community-centric facility that offers a range of aquatic opportunities, including swimming, diving, water polo and synchronized swimming, for both national and international events. The new centre was eventually brought under one umbrella along with the NSC’s other facilities which include a track and field stadium, cricket field and artificial hockey pitch. In October 2009 plans for an Olympic-size swimming pool at the National Sports Centre, since completed, were available for the public to view. The plans included a 36ft high diving platform featuring five boards, plus four additional springboards. A scoreboard and 60ft lighting are to illuminate the sporting fixtures. There are female and male changing rooms, each housing 137 lockers. The Trustees of the Bermuda National Centre applied and got for planning permission for the project here. Phase One of the Aquatic Complex featured a 50-metre swimming pool, diving platform, 279 spectator grandstand, temporary changing facilities, temporary surface parking and mechanical support areas. Government first announced plans for the Olympic-size pool during the 2008 Throne Speech. The outdoor aquatics centre was opened in time for the 2013 Island Games. Private sector funding made up any shortfall. This main coastal road runs east to west, on the 10 and 11 bus routes. 2 Barker's Hill Road, Devonshire Parish DV 05. P. O. Box DV 358, Devonshire DV BX. Phones: Office 295-9092 (fax 295-9097); Pro Shop 295-9093; Tee Times 234-4653; Golf Pro 296-3917; Maintenance 236-6758; Restaurant/Bar 295-9069. E-mail oceanview@bermudagolf.bm. In June 2006, the Bermuda Government's House of Assembly passed an Act that switched responsibility for the Government golf courses from the Ministry of Works & Engineering to Tourism. A 9 hole par 35 course over 2,819 yards. It is not generally known by most Bermudians or golfing visitors that the site of one of the units of the clubhouse here was once a grand old manor house known as Watlington House, now used as a storage facility. It was used for British Army purposes during World War 2. The former Fort Langton and part of its structure were used as the foundations for the clubhouse after the war and more of the former fort became the bus garage in the 1970s. On the field below the bus garage, now the golf course, were two US Army posts during World War 11. One was a unit of the US Army Signal Corps and the other was the US Army's Artillery, at APO 856. It was a unit (including 1st Platoon Battery A) of the 423rd Field Artillery Group, under the command of Captain F. W. Clipper, US Army. For visitors who arrive at the airport on one of the commercial airlines or cruise ships, the closest cruise ship berth is the City of Hamilton, about three miles away to the east. If you bring your own clubs, you won't be able to go by public transportation (bus). Instead, take a taxi. Buses only go a part of the way. Check rates directly with course depending on time of day and time of year. Public. Ask about playability on the day you have in mind. Middle Road, at the junction with Brighton Hill Road. It is next door to the Anglican (Episcopalian) parish church. On Sundays, Holy Communion is at 8.00 am and Matins and Sermon are at 11.00 am. It was originally built in 1624, although the present foundations date from 1716 when it replaced a place of worship that blew down in a hurricane. The church silver plate was manufactured in 1590, was enraged with the Tudor rose and brought to Bermuda later, especially for the original church. There was extensive restoration done after a mysterious fire, by an arsonist on Easter Sunday night in 1970. It was reconstructed afterwards. The interior, especially the "ship's knees" construction of thereof, shows how local church builders used many of the techniques used by ship builders of the period, suggesting both were in in this trade also. There is also some most interesting other Bermuda cedar woodwork including the alter screen, carved with hearts and fleur de lys that symbolize love and purity with an aromatic scent. A Bermuda National Park. Also, an historical house, by the same name, is nearby. North Shore Road, Devonshire Parish. Built by landowner William Williams in or around 1700, it was passed down through his family, coming to Benjamin Cox at the end of the century. Cox's first wife, Frances, died in mysterious circumstances in 1790. When his second wife Mary Robinson died in 1793, it was rumored she had been killed by poisoned coffee. The horrific deaths led to the home briefly being renamed Bleak House. The property eventually came to Benjamin S. Williams, church warden and choirmaster at Devonshire Church. He lived there with his wife, the eccentric Frances Cox Williams, and their five daughters. They were evicted when the house was appropriated by the War Department in 1868. It was acquired for the British Army in 1868 when it occupied most of Devonshire Parish, appropriated by the War Department for inclusion in the Prospect Garrison and in 1868 became the single officers' quarters. It later became the club house for the Garrison Golf Course, but deteriorated over the following decades. During World War II, still owned by the British Army, It became officers quarters and later the garrison's golf club house and was roundly wrecked by servicemen. It became officers' quarters and then later a club house. During World War 2, a female wartime censor staying there with other specialist wartime women was raped and murdered as she was leaving the grounds. It was partially reconstructed in the 1940s but still remained a long way from its former glory. Before the British Army left in the 1950s it was in a dilapidated condition. In 1948, the Bermuda Historical Monuments Trust (later, Bermuda National Trust, BNT) founder Hereward Watlington acquired a lease out of concern at the property's rundown condition. He spent the next few years restoring it, undoing the military's alterations and facilitating replacement fittings from other properties on the Island. 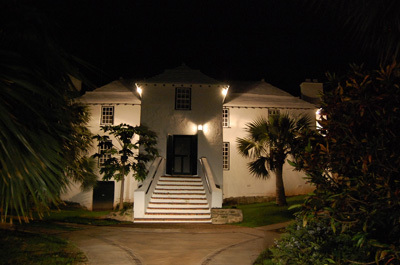 When referred to as Bleak House, the BNT rented it to the Bermuda Police as the residence not far from Police Headquarters at Prospect of then UK expatriate Commissioners of Police who lived here with their families. On September 9. 1972, Commissioner of Police George Duckett, after returning home, was murdered in cold blood here with his daughter also badly injured by the murderer. This lovely 300 year old house with its chequered history, an architectural gem, then became for over 40 years the BNT leased home of retired Wing Commander Mo Ware and his wife Sylvia Ware. He was former Director of Civil Aviation. Until cleared away the property also "housed" the remains of Ware's old Luscombe airplane (see Bermuda Aviation). After his death the property was comprehensively and expensively restored, completed in December 2008, by the Bermuda National Trust at a cost of over Bd$1 million, to its 18th century splendor as a good example of Bermudian architecture (it has the cruciform structure and grand "welcoming arms" staircase). The 2,050-square-foot property has a separate guest cottage, and views. There is a formal dining room, state-of-the-art kitchen with access to a private courtyard, spacious living room with exposed wood beams and a wood burning fireplace, and powder room on the ground floor; master suite with a fire place and a master bath with his and hers sinks and a toll top tub; two additional bedrooms share a full bath situated on the second level of the home and there are attractive and expansive gardens. During the extensive renovation work the floors, roofs and beams were retained as far as possible. Old windows were also patched rather than replaced. The Trust aimed, as much as possible, to repair rather than to renew, and to remove past inferior work. Junction of and in between the North Shore and Palmetto Roads. A Bermuda National Park. A small, pleasant, grassy, open park, with mature palm, palmetto and casuarina trees, It's very hilly, with an almost 45 degree slope. It offers choice views of the North Shore ocean. There are no facilities in this park, nor is there any admittance fee. It's more a place to linger for a few minutes to enjoy the view, or for a brief picnic. But not during morning or evening rush hours when the sounds of traffic on both roads will destroy the peace. South Road. Managed by Gibbons Management Services Ltd, P. O. Box HM 1194, Hamilton HM EX, phone 295-0022, fax 292-1277. The 18+ acres of gardens are open Monday through Thursday. They have lovely South Shore views. Residents and visitors often have their wedding pictures taken here. There is an aviary of tropical birds - parrots - and are open year round, with free admission. The Waterworth family built Palm Grove and it was their family until the death of the patriach in the late 1940's after which it was sold it to the Gibbons family of merchants, bankers and former legislators (one was a Premier and another was the former Minister of Finance). Be sure to see the Bermuda Moon gate and map in a pond. Long since gone, but the name remains as as a one-time reminder of Bermuda's long British Army military history. Prospect Garrison was the headquarters, with many buildings as barracks for men and houses for officers. What is now the Bermuda Police HQ and Club was originally an Army base HQ and Officers' Mess, respectively. Cedar Park once nearby was the name of an old Bermuda house on Cedar Park Lane. The British Army acquired it and many other properties and roads or streets when it assumed control in the 1850s over most of Devonshire Parish when the local population was only a small fraction of what it is now per capita. Since then, virtually all traces of the British Army's presence in Bermuda have long gone, having made way for development and much redevelopment including for Bermuda Police HQ and buildings, National Sports Centre, a secondary school, playing fields and to generally help reduce to some degree Bermuda's chronic affordable housing shortage to accommodate 68,400 people in only 21 square miles. A street chiefly notable for being the place of the Cavalry Prospect Roman Catholic Church Cemetery in Bermuda, the only RC cemetery on the island. A Bermuda National Park. Just a little west of Palmetto Park, on the North Shore Road, this is another little beach at low tide and coastline park, with no facilities. But you can observe early morning marine traffic, such as cruise ships en route to or from the city of Hamilton. Avoid it during rush hours. For those with an enquiring mind, this place has a fascinating social and naval history. It takes its name from a once-white-in-complexion and aristocratic family by the name of Robinson. Sir Robert Robinson was appointed by the monarch in the United Kingdom as Governor of Bermuda and arrived in 1687 as the first royally-appointed governor after the dissolution of the Bermuda Company governors, having relieved the last of that ilk, Richard Coney. Robinson is believed to have returned to England later, but by himself, not with his English wife whom he deserted. Another Robinson family was started, with the same sire but instead, his black Bermudian mistress. From them sprang a prominent local family. In the early 19th century the Robinson's operated a store here. When the 1812-14 War against the USA started, the once-quiet cove became an exclusive private beach for officers of the Royal Navy and their equivalents in the British Army who later sailed from Bermuda and whose exploits included torching and looting the White House in Washington, DC. There are still signs here of such military use, such as steps carved into the water and old changing huts made from thick local limestone. 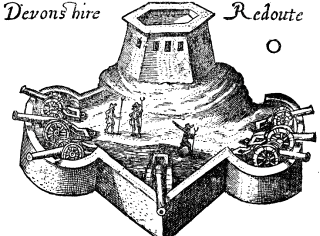 They then owned Seven Wells and were the operators of the water wells from that property that supplied the British fleet that attacked and burnt the White House in Washington, DC. In 1815, when the British returned to Bermuda from that campaign they brought with them looted pieces of furniture from the White House, some of which were sold to the Robinsons. Cedarbridge Academy, 1 Cedarbridge Lane, Devonshire. Phone 296-5665. On the # 1 bus route. The Devonshire Parish part of this main road going east to west is short but scenic. Going east, it begins just before the junction with Tee Street and proceeds towards Smith's Parish. On the way, you'll see the entrance to Ariel Sands on your right, the junction with Brighton Hill Road to the left, then Devonshire Bay Road on the right. You'll also pass the entrances to Palm Grove Gardens and the Edmund Gibbons Nature Reserve on your right before you come to the junction with Collector's Hill to the left with its small churches, and shopping center to the right. At this point, continuing east, South Road quits Devonshire Parish and becomes part of Smith's Parish. Middle Road. Government-owned. When she was Premier from November 1998 to July 25, 2003, Jennifer M. Smith, JP, Member of Parliament for the Town of St. George, lived here, rent free, at taxpayers' expense. 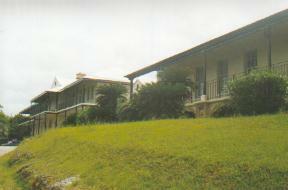 "Crown Hill," 16 Middle Road, Devonshire DV 03, Bermuda. P. O. Box HM 325, Hamilton HM BX. The consulate for visiting Americans (more than 85% of all Bermuda's visitors are from the USA) and others with legitimate business. Telephone (441) 295-1342. Fax (441) 295- 1592. See connections between Bermuda and USA. Following bombings of US embassies in Africa and the Middle East, the US Congress mandated that Bermuda's US Consulate General should be similarly upgraded in security standards. The Bermuda facility has a nine-foot high perimeter wall/fence; a vehicle barrier and access control center at the entrance gate; hardened interior walls around the building; and installation of blast-proof windows. 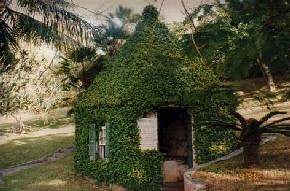 Additionally, there is a secure Controlled Access Center (CAC) building for most routine work, but in the shape of a Bermuda cottage. Off Middle Road, near the Teleport Terminal. Named after an old Bermudian family. For the first half mile or so, this street is mostly residential. Then it becomes more country like. See many examples of Bermuda's endemic trees growing on the southern side of the road, on the northern edge of the Devonshire Marsh bordered by the road. Keep going, for the Winifred Gibbons MBE Nature Reserve and on the right the National Equestrian Center. Vesey Street, off Middle Road. This 2 acre site was established in 1993 in honor of the late Winifred Gibbons, businesswoman and philanthropist, Member of the British Empire, of the prominent local Gibbons family. Like other reserved areas of the Devonshire Marsh, it serves as a sanctuary for birds, endangered species of local fauna and a breeding ground for indigenous trees and wild orchids. It is another especially interesting place for botanists, entomologists and those who appreciate nature generally. 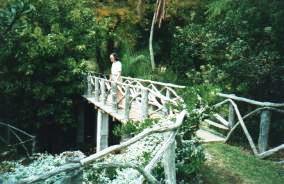 It is under the care and protection of the Bermuda Audubon Society and Bermuda National Trust.